The company also has a new Wi-Fi smart plug. Router and smart-home product manufacturer TP-Link announced two new products today: A weatherized outdoor home-security camera to go with the well-regarded indoor model that’s already on the market, and a new Wi-Fi smart plug with dual outlets that can be controlled independently of each other. The Kasa Cam Outdoor ($139.99) is a ball-shaped Wi-Fi home security camera offering 1080p resolution and a 130-degree field of view that TP-Link says eliminates the need for pan/tilt features. Once its bracket is mounted to the wall, the camera body can be rotated inside the bracket’s magnetic socket to provide the best coverage. The camera captures video in 1080p resolution and is outfitted with a mic and speaker for two-way conversations. The user can also trigger an onboard siren (rated 80db at one meter) from the Kasa app to intimidate unwanted visitors. The camera enclosure is rated IP65, meaning it is dust tight and protected from water jets from up to a 6.3mm nozzle from any direction. 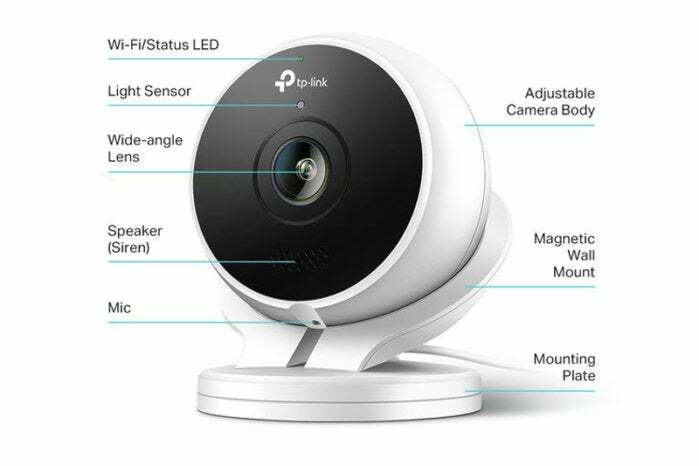 TP-Link's Kasa Cam Outdoor has all the features we've come to expect in outdoor security cameras. There’s an in-line USB power adapter designed to be mounted to a wall, so the camera’s 10-foot cord can be plugged into a weather-resistant outdoor outlet. TP-Link intends to eventually offer a 15-foot extension cord for $19.99 to make the camera easier to deploy, especially for buyers who elect to decide to drill a hole in their outside wall, so they can snake the cable through to an indoor outlet. The camera is equipped with infrared LEDs that provide up to 30 feet of night vision. In order to reduce latency, live video can be streamed to the Kasa app in real time when both the camera and the smartphone the app is running on are connected to the same Wi-Fi access point. Live video can also be streamed to Alexa-supported displays (Amazon Echo Show, Echo Spot, or Fire TV), as well as displays that support Google Assistant (e.g., Google Chromecast). TP-Link provides free cloud storage for up to two days of video history from up to three cameras, with a further limit of 1GB of memory. That’s enough to store around four hours of 1080p video, according to the company. A paid Kasa Care Plus plan extends cloud storage to 14 days of video history or 14GB (sufficient for 60 hours of 1080p video) at a cost of $4 per month per camera ($40 per year, if paid annually). Kasa Care Premium, meanwhile, extends storage to 30 days of video history or 30GB of memory (128 hours of 1080p video) for $7 per month per camera ($70 per year if paid annually). In all cases, videos can be downloaded and shared. 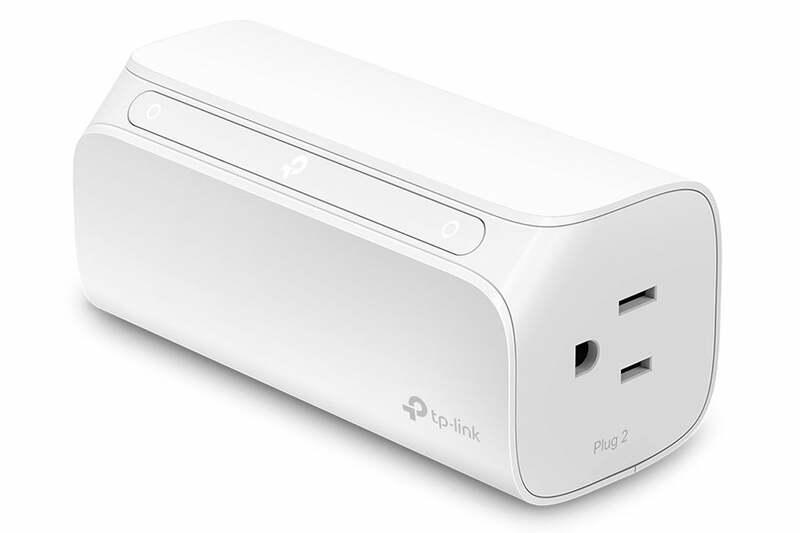 TP-Link's new HS107 smart plug has two outlets that can be independently controlled via Wi-Fi. The feature that sets TP-Link’s HS107 Wi-Fi smart plug ($39.99) apart fdrom the competition is its dual individually controlled 15-amp outlets. The horizontal enclosure converts one grounded wall outlet into two without blocking access to the other outlet in the wall. In addition to being compatible with Amazon Alexa and Google Assistant, the HS107 is compatible with Microsoft’s Cortana digital assistant and IFTTT. TP-Link estimates that seven out of 10 Kasa device users attach the product to a voice assistant. The HS107 is controlled via Wi-Fi, so there’s no hub required. It comes with an app that supports the creation of scenes and schedules, and you can control it remotely from anywhere you have internet access. It joins TP-Link’s existing family of Wi-Fi smart plugs, bulbs, and in-wall light switches.